To analyse a set of data (in Microsoft Excel), and write a brief report (in Microsoft Word), identifying and explaining your insights into the operation of Trade Fair organized by “Ballarat Event Management Company” in the first six months of 2016. Ballarat Event Management Company (BEMC) specialises in promoting and selling both (i) stand space at trade fairs and (ii) tickets for visitors to trade fairs in Ballarat region. The company currently promotes and sells two different sized stand spaces (small and large), to new or returning exhibitors, for a number of Trade Fairs locally and overseas. BEMC also provides a number of additional value-added services to exhibitors for fees such as organising exhibitor stands, developing marketing material for exhibitors to distribute at fairs, arranging travel and/or accommodation for exhibitors, and hospitality/catering for exhibitors to offer their customers attending the trade fair. BEMC also organise visitor tickets for the trade fairs, which also provide commission income. All these activities are managed through the efforts of a number of sales representatives. The company’s founder, Ms Diamantina White, like all small business owners, is always interested in finding ways to increase revenues and decrease expenses. Ms White has provided you with the half-yearly sales information of this year (2016) in the “BEMC_sales_first_half_2016.xlsx” file. The data needs to be analysed and visualised to help observations related to the business operation and its shortcomings. 2. Total profit, sub-totalled by each (a) Trade Fair, and (b) Sales Representative. Use Pivot Table(s) and appropriate graph(s)/chart(s) to summarise these calculations. 3. Total hours worked, sub-totalled by each (a) Trade Fair, and (b)Sales Representative. Use Pivot Table(s) and appropriate graph(s)/chart(s) to summarise these calculations. 4. Total income, sub-totalled by each (a) Trade Fair, (b) Sales Representative, and (c) Income type. Use Pivot Table(s) and appropriate graph(s)/chart(s) to summarise these calculations. 5. Total expenses, sub-totalled by each (a) Trade Fair, (b) Sales Representative, and (c) Expense type. Use Pivot Table(s) and appropriate graph(s)/chart(s) to summarise these calculations. Ms White requires you to make observations to help her with the following questions. Who are BEMC’s five best and five worst customers by total profit? Use an appropriate table and graph/chart to summarise these observations. What are BEMC’s best and worst Trade Fairs by total profit? Use an appropriate table and graph/chart to summarise these observations. Who are BEMC’s best and worst sales representatives by total income? Use an appropriate table and graph/chart to summarise these observations. 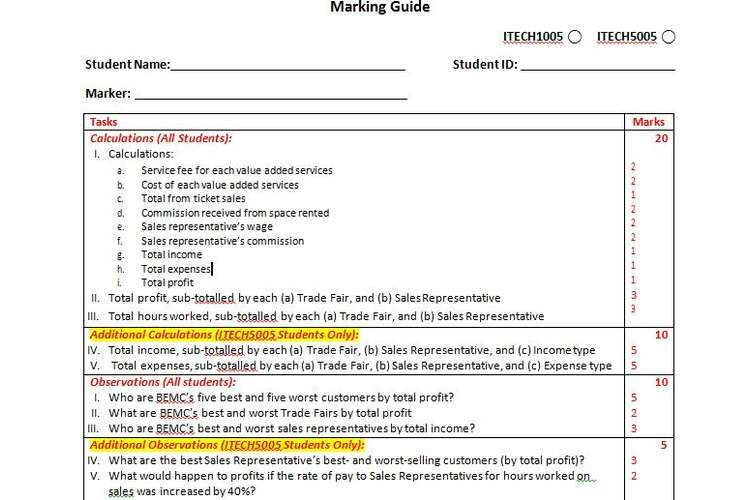 Ms White also requires you to make recommendations concerning the following business-level questions.